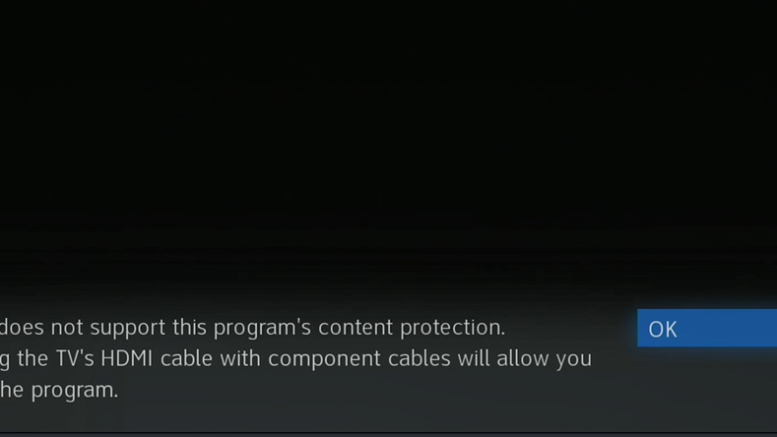 It seems that DIRECTV’s Genie Mini Clients are a little more strict when it comes to enforcing HD Content protection than its DVRs are. I found this out when I recently replaced a receiver with a Mini Client and got the message above when I tried to connect using a component cable. I, like many other people, run more than one TV from the same DIRECTV box, which helps save on mirroring fees with TVs I don’t use a lot. I wasn’t expecting this hiccup. HD Content Protection (HDCP) is a scheme hooked up by content providers that’s designed to keep you from making perfect digital copies of your content. Along with other forms of encryption, HDCP was supposed to stop massive video piracy. It’s hard to say how much piracy would have taken place without these things in place, but my younger friends tell me that between password sharing and torrenting, it’s easy to get any content you want for free, as long as you’re ok with breaking the law. (Personally I’m not.) So, the real effect of HDCP is to make it harder for people like me to legally and ethically share programs to multiple TVs. Solid Signal has a lot of different HDMI splitters at different price points, depending on what you need. If you have a specific need like 4K or 3D, you can start spending a lot of money, but in many cases the less expensive ones work great too. Then, instead of using component cables, use a long HDMI cable (we have them in lengths up to 75 feet) and you have the same result with even better quality. This worked for me and I really haven’t had any problems. If you get this message while watching an old tube TV, even with no other TV connected, it’s generally due to an HDMI cable also being connected. Disconnect the HDMI cable and use a Genie Composite Cable instead. Then, reboot the client by pressing the red button and it should work just fine. Why doesn’t this happen on the receivers? The receivers aren’t as strict in enforcing content protection, at least for now. But there’s always a chance that would change so just going back to a traditional receiver isn’t worth the risk. If you have no idea what I’m talking about that’s great, but a lot of people with older HDTVs find that when they go to the guide or playlist the TV blacks out for a second and comes back, almost as if there was a signal loss. This, unfortunately, is also due to HD Content Protection. The guide and playlist pages don’t have it, but the live programming does. Switching back and forth from a protected to non-protected source is what’s creating that particular annoyance. Unfortunately, replacing the TV is pretty much the only fix for that.